The use of cycles is perhaps the most misunderstood areas of technical analysis. And is widely miss used within automated trading systems. This is because there are a wide variety of approaches ranging from magnetic, to astrology to time based cycles. The purpose of this tutorial on cycle analysis and implementation into automated trading systems is to present a logical perspective on what cycles and how they enhance your technical analysis studies. Originally I was attracted to cycle analysis back in 2001. Back then, there was very little information about cycle analysis and even less on how to identify them within financial instruments. Cycles can be somewhat measured using conventional indicators such as RSI, stochastics and moving averages. But, better yet is a custom cycle analyzer indicator I created to make cycle identification and implementation automatic within my trading strategies and my fully automated trading system. 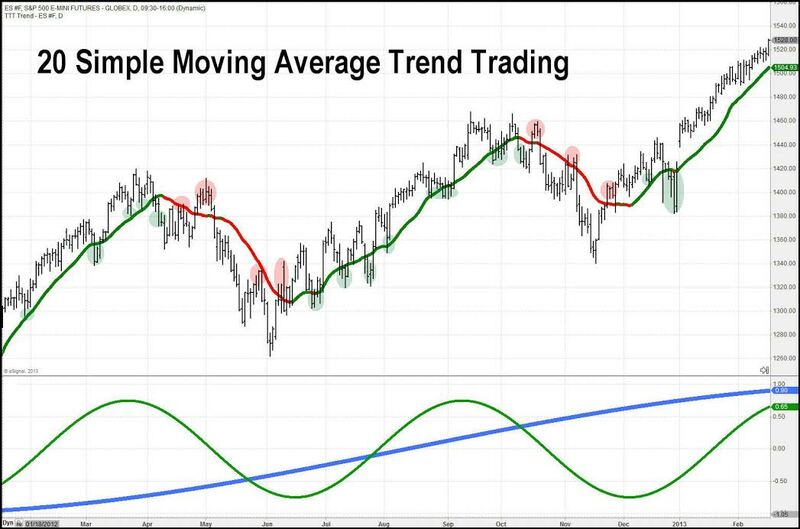 Here is how the moving average can help spot cycles, but keep in mind they are lagging indicators. The lower indicator shows the long term cycle and swing trading cycle I focus on. Remember cycle lengths change over time which is why I automated the indicator and have it run within my automated trading system. But you should get the gist of how cycles look and function. I am going to touch quickly on a few areas of cycle analysis which I hope you find somewhat interesting. Cycles also known as waves are observed almost everywhere including nature. Ancient civilizations designed calendars and time measurements cased around cycles. This has creating the most standard measurements we all live by and track on a regular basis. The length of day, year, seasonal changes and even the phases of the moon and stars. These are just time based cycles but the same type of thing carries across noise like musical notes, light spectrum’s, and in liquids like waves in the ocean. The financial markets are truly efficient and follow random walk principle. The fact that so many like Larry Williams and Paul Tudor Jones along with many other long term consistent traders pull money from the financial markets prove this if a more detailed analysis of the random walk theory is applied and you will see some interesting results through cycle analysis. Understanding cycles and through tracking where they are I their current phase gives you a pretty good idea to where the financial market is headed for a short distance into the future with high level of accuracy. The stock market or any financial instrument chart is similar to an aerial photo of a river. There are times (sections) where the price movements appear random while other sections have distinctive cyclic pattern (waves or a snake like pattern). No matter how good you are of a trader or investor you are, trading the markets requires us to take a leap of faith along with many assumptions to follow our trading system whether it is an automated trading system or not. Understanding cycles is just a piece of the overall puzzle although I would account for it to be 1/3rd of my analysis for timing and position management of my automatic investing system. So what are the other pieces of the puzzle? According to my research the market is in a cyclical state roughly 20-35% of the time. Logic indicates that you should have a trading strategy that can identify and trade this type of price action. The stock market trends roughly 25-35% of the time also. So another trading strategy is required for taking advantage of this price action also. And then there is the random none tradeable price action. This is when the market is giving off mixed signals and this typically happens during a change in market conditions from an uptrend to a down trend or from cyclical price action to a trending market. Understanding and identifying what I just talked about will greatly improve your trading, investing and reduce stress and emotional trading. In conclusion, it took me years of studying cycles to master identification and timing of trades based around them and to be honest I am still learning and improving this process. If this short tutorial sparked some interest then I highly recommend opting in to my free newsletter below. In a week I will be making my soon to be published book “Technical Trading Mastery – 7 Steps To Win With Logic” which is the perfect holiday read and trading education book to kick start 2014. I will be making the book available to my followers only two months before it’s available on Amazon, Barns & Noble’s etc., which won’t be until Feb. While I am bias towards this MUST READ BOOK, I feel it will truly improve how you think, feel and trade the markets for the rest of your life. Happy Holidays, and remember to send me your feedback and ideas on topics you would like me to learn more about!